I didn’t know until I read Margaret Hutchison’s book that London’s Imperial War Museum occupies what was formerly the central portion of the Bethlem Royal Hospital, an ancient lunatic asylum more commonly known as ‘Bedlam’. One would be hard pressed to identify a more appropriate site for an institution commemorating World War I. Until February 2019, the IWM is mounting Lest We Forget?, an exhibition featuring ten of the monumental paintings commissioned by the British government after the war for a Hall of Remembrance that was never built. The Australian War Memorial, by contrast, has only chosen to stage a virtual exhibition, Art of Nation, highlighting just a fraction of its Great War art collection. The online show’s use of Charles Bean’s original design of a purpose-built art gallery to display Australia’s official war art is instructive when compared with the AWM’s long-standing practice of combining artworks with dioramas, photos, film, and battlefield relics in its permanent exhibition on the war. 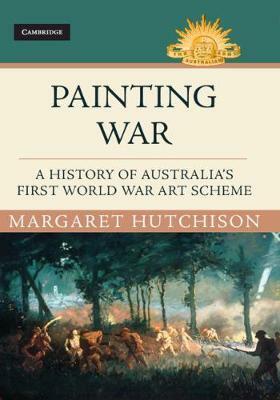 One of the virtues of Hutchison’s Painting War is that it helps us to understand the ways in which the commissioning, production, and display of Australia’s official war art diverged from the practices of other countries. Originating as a PhD thesis under the supervision of Joan Beaumont and published under the auspices of the Australian Army History Series edited by Peter Stanley, the result is almost inevitably a fine piece of honest history. Hutchison tells her meticulously researched story with an admirably straight bat. Painting War focuses on why the art scheme was created, the people who were instrumental in its development, and what role this art has had in shaping Australians’ memory of the war. While numerous politicians, generals, bureaucrats, and artists were involved in the scheme’s creation, it was the troika of Charles Bean, Henry Smart of the Australian High Commission in London, and John Treloar of the Australian War Records Section (AWRS) that was the most influential in specifying which artists and what kind of art were wanted. The art scheme originated in a growing awareness, following the carnage of Gallipoli and rising casualties on the Western Front, that Australia’s contribution to the war effort needed to be recorded and memorialised. It was Andrew Fisher as High Commissioner who initiated an Australian War Records Office (AWRO) at the London High Commission. Fisher and Billy Hughes were also in rare agreement about both the importance of visual records, including fine art, and a war museum in which to house them. Fisher and Bean were also aware of the Canadian government’s establishment of its own war art program in early 1916. This was a useful precedent which helped the Australians to resist Whitehall’s preference for an imperial war records effort which it could control. 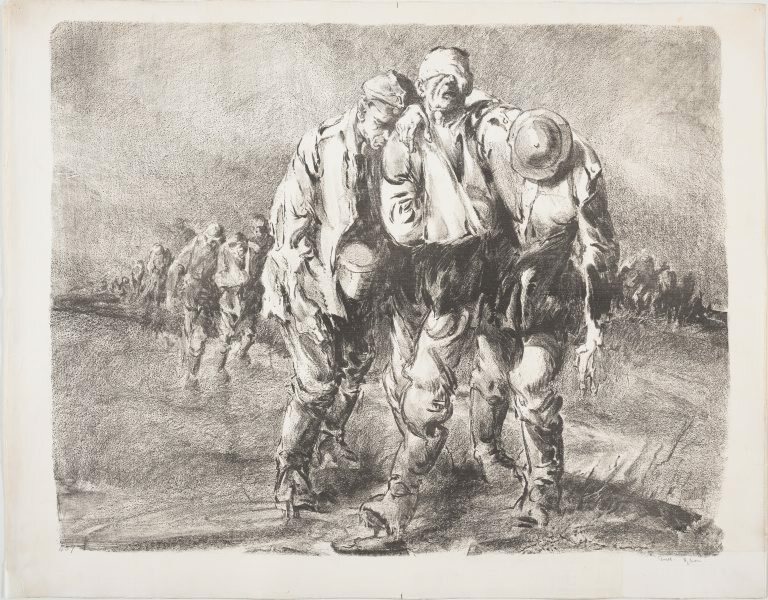 The case for engaging artists was made variously by the cartoonist Will Dyson, Charles Bean – who had already used the art work of serving soldiers in The Anzac Book – and the expatriate painter Arthur Streeton. Their principal argument was that, whatever the value of film and photography as visual records, competent artists would be better able than photographers to record the Anzacs’ ‘character’ and less likely to ‘fake’ a scene. They also noted that paintings had the advantage of colour, permanency, and the prestige of a long tradition of imperial battle pictures. On the strength of these arguments, the Australian war art scheme was finally established in May 1917. It was divided between the High Commission’s AWRO – where Smart oversaw the work of commissioned expatriate artists – and Defence’s AWRS overseen by Treloar, who looked after artists serving in the AIF. Linking the two schemes was Bean, who would be responsible for keeping an eye on these artists when they were deployed to France and Belgium. Given the troika’s near complete ignorance of art, two distinguished British artists were invited to join an Art Committee which unfortunately was not convened until a year later. By this time, Smart had already chosen all the (exclusively male) expatriate artists, while Treloar had yet to appoint any soldier artists. 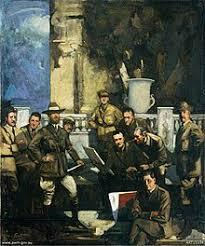 It was a recipe for administrative chaos and dissension in the ranks of the artists (usually inspired by Streeton). More importantly, it resulted in huge gaps in coverage of the AIF’s engagements. Nevertheless, as Hutchison notes, the Australian scheme that emerged was surprisingly coherent in its choice of subjects and the style in which they were represented. During the war, it focussed almost exclusively on the Western Front and, more particularly, wherever possible, the front line experience of the common infantryman. The insistence on the documentary character of the art pushed the artists into a more academic or representational treatment, which not only played to their strengths but was also regarded as far more palatable than modernism to both veterans and the bereaved. The Canadian and British schemes, by contrast, employed both traditional and modernist artists to create works that extended far beyond the front lines to include the home front as well. Still, in all these programs landscapes became the dominant genre, while battle pictures were few and far between. Highlighting the experiences of Dyson, Streeton, and George Lambert, Painting War emphasises the relative freedom in which the expat artists worked, partly because Smart issued no guidelines and Bean was too busy with his work as the AIF’s historian. (The far more thorough Treloar provided AIF artists with useful instructions and also sought their input.) The focus on eyewitness accounts, coupled with the requirements for artists to stay out of harm’s way, inevitably curtailed their opportunities to sketch live skirmishes, let alone major battles. With that caveat, these art workers managed to capture in their own distinctive ways a great deal of life on and near the front lines. Dyson’s iconic images of stoic diggers and Lambert’s work ethic and dedication to the scheme endeared them both to Bean, whose regard for Streeton was far more muted. Following the Armistice, the art scheme’s troika quickly identified the most noticeable gaps in its coverage of the AIF’s role in the war, above all the Gallipoli campaign that predated the scheme. In an effort to fill these gaps, Bean and Co. redefined the role of artists as the war’s historians rather than its eyewitnesses, and placed them under much closer scrutiny. This reorientation’s greatest success both aesthetically and in terms of record-keeping was Lambert’s series of Gallipoli paintings. Thanks to Bean’s close involvement with Lambert through the Australian Historical Mission to Palestine, these works represented a far more deliberate construction of memory that inscribed their vision of Anzac and what it meant for posterity. Between 1920 and 1922, the focus of Bean and Treloar (with Smart now sidelined in London) was to mount a prototype exhibition, not only to prefigure what the Australian War Museum would look like but to promote its status as the country’s sole national war memorial as well. The exhibition opened in Melbourne on Anzac Day 1922 with the title Relics and Records of Australia’s Efforts in the Defence of Empire, 1914-1918. Bean described the artefacts as ‘emblems of those splendid qualities which made the Australian soldier … the greatest individual fighter in the war’. As he also made clear, these relics were also intended ‘to impress on visitors the sacred and memorial nature of the collection’. Mounted above the display cases were some of the official war art, which would be further subsumed in later years by the addition of dioramas, photographs, and film screenings. Hutchison concludes that the art scheme helped to lay the foundation for how Australia’s role in World War I was framed, above all by Bean but also with the aid of Smart and Treloar. She also notes how the scheme became a template for Australian war art as a commemorative practice focussed, on the one hand, on intimate, poignant scenes at the front lines and, on the other, on sweeping panoramas and landscapes. Australian war artists 1916-18 painted in 1920 by George Coates (Wikipedia). The painting presents, left to right: front George Bell; standing John Longstaff, Charles Bryant, George Washington Lambert, AH Fullwood, James Quinn, H. Septimus Power, Arthur Streeton; and seated back Will Dyson, Fred Leist. The program’s exclusions were just as important, however. The army was reduced to the infantry, the navy and Royal Flying Corps rarely depicted. The home front was ignored altogether. By concentrating entirely on the AIF, the AWM’s narrative excluded the far more sizeable contributions of Britain and France, as well as the equally heroic efforts of other imperial forces. By the exclusion of ‘statements’ about (the) war’s wider meaning and effect, we are left with artworks that offer nothing more than testimony to individual soldiers’ bravery and sacrifice. For all its strengths, Hutchison’s narrative could have been improved in at least two respects. She could have made far better use of her 64 well-selected illustrations, if only by inserting into the text the figure numbers of the works she was discussing. This would have improved her story-telling by encouraging the reader to look at the illustrations in the context of the argument. More importantly, Hutchison’s reliance on the current dominant narrative of art historians that privileges painting over illustration has weakened her interpretations of the standing, work, and style of the expat artists in particular. Dyson, AH Fullwood, Lambert, and Frederick Leist were all highly skilled illustrators as well as fine painters; Streeton was not. Nevertheless, Painting War will now provide future (art) historians with a far more solid foundation for appreciating the Australian art that emerged from the Great War. In particular, the book should encourage other scholars to dig more deeply into the AWM’s artist files and art works to present a more complete portrayal of the work of the lesser-known AIF and expat artists who contributed to the scheme. * Gary Werskey is an Honorary Associate in the Department of History, School of Philosophical and Historical Inquiry, University of Sydney. He is currently prepared a biography of the British-Australian official war artist AH Fullwood. For Honest History previously, he wrote about Fullwood’s Anzac Christmas card.